Blog > The Clickworker App for Android is here! 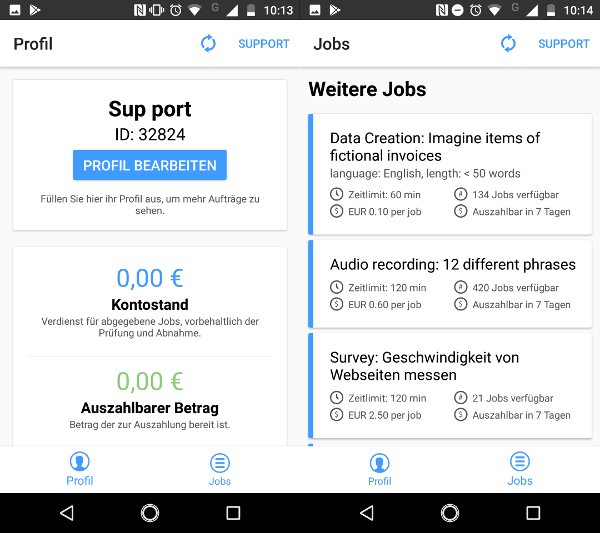 The Clickworker App for Android is here! It’s been available for iOS for quite a while now, but the Android version of our “clickworker app” is now finally available in the Google Play store. The app is available for immediate download from the Google Play store. You can either search for “clickworker app” directly in the store, or you can simply use the links above. As soon as possible we will also add a direct link in Workplace. Installation takes place as usual: click on “install” and wait briefly for the confirmation message. The app is then immediately ready for use. When you open the app, the log-in screen appears. If you already have a Clickworker account, select “login” and use your regular username and password combination. If there’s a problem logging in, please check first to make sure your user name was entered and not your email address. If that doesn’t solve your problem, don’t hesitate to contact us via help@clickworker.com. All those who are new to our website select “Register” and set up a new account by answering a few simple questions. If registration/login was successful, you’ll arrive at your profile. Right now this only offers a few functions, but new features are being planned. Currently you can see your account balance, the actual payable amount of that, a button to log out and information about the app version installed. The most important part of this screen is the “jobs” icon at the bottom, which takes you to the actual job list. This is the core of the clickworker app. In the job list you will find all tasks that are enabled for the app user. For technical reasons not all types of projects can be displayed in the app yet. Currently only surveys, text creation and translations are shown and each project has to be manually activated. Our goal in the long term is to be able to display all jobs, both in the browser version and on the app, so that you have the choice of which device you’d like to work on. The “mobile” projects particularly are very high on our list for this endeavor. Working on jobs is in principle the same as in the browser version. Certain functions however have been adapted to the technical parameters of the app. Where possible, forms and data input have been simplified. Jobs can now be saved in progress and completed at a later time. You can even complete other jobs in the meantime and only then go back and finish the saved job, but only within the reserved time limit of course. If this time expires, even saved jobs go back into the task pool. It is not possible however to switch devices after saving a partially completed job, and for example finish a writing assignment in the browser. What was started in the app, must also be completed in the app. There are already a number of ideas on how to improve the app in the future. We have a lot of plans especially for the functions: more types of projects should be workable in the app, and in addition we’d like to expand the scope of the administrative section. That includes for example registration directly through the app, and filling out the user profile, both of which are currently only possible in the browser version. In future we would also like to make qualifications, account statements and invoices available via the app too. And a small visual improvement, for example the displaying of your own profile picture, is also going to be incorporated. Of course we also look forward to suggestions from the community. Let us know what you think is missing. For that reason we hope that as many cickworkers as possible install the app and try it out. Help us by providing feedback about how the app could be made even better in the future. So get going and download the app right now! Dieser Artikel wurde am 13.September 2018 von Daniel Marz geschrieben.